I was driving westbound on the Schuylkill Expressway in Philadelphia this morning and saw a Fox Mustang convertible (red exterior, black top). A good enough reason to write a blog entry about these attractive cars. For 1983, the big news for the Ford Mustang was the return of the convertible for the first time since the 1973 model year. Introduced on November 5th, 1982, the convertible was available only in the luxury GLX trim and the performance GT trim—lower-end L and GL trims remained with the notchback coupe (L and GL) and the hatchback coupe (GL). The GLX was also available only with V6 and V8 engines (no inline four—turbo or not—would sully the drop-top experience). The V6 engine choice for the GLX was the Essex 112 bhp 3.8 liter/231 ci with a two-barrel carburetor. Optional on the GLX ($595 additional) and standard on the GT was (of course) the Windsor 175 bhp 4.9 liter/302 ci V8 with a four-barrel carburetor. Starting at $9,449 (about $24,200 in today’s dollars) and rising significantly during the middle of the model year to a non-trivial $12,467 (about $31,600 in 2018 funds, which is almost exactly what a 2019 Mustang EcoBoost convertible starts at), the GLX did come reasonably well equipped. Standard external and mechanical features included power front disc brakes, tinted glass, and an automatic transmission. Standard interior equipment included light group and AM radio. The GT version of the convertible listed for $13,479 (about $34,600 in 2018 dollars). Standard external and mechanical features included power front disc brakes, power steering, rear spoiler, and a five-speed manual transmission. Standard interior equipment included an AM radio. All 1983 Mustangs included dual rectangular halogen headlamps, a modified MacPherson strut front suspension, front disc/rear drum brakes, and rack and pinion steering. Inside, full instrumentation (tachometer, trip odometer, fuel/temperature/oil/alternator gauges), full vinyl bucket seats, and a cigarette lighter were included. The Mustang option list was long. Inside, air conditioning ($724), speed control ($170), power locks ($160), tilt steering wheel ($105), and AM/FM stereo radio with a cassette player ($199) were all available. 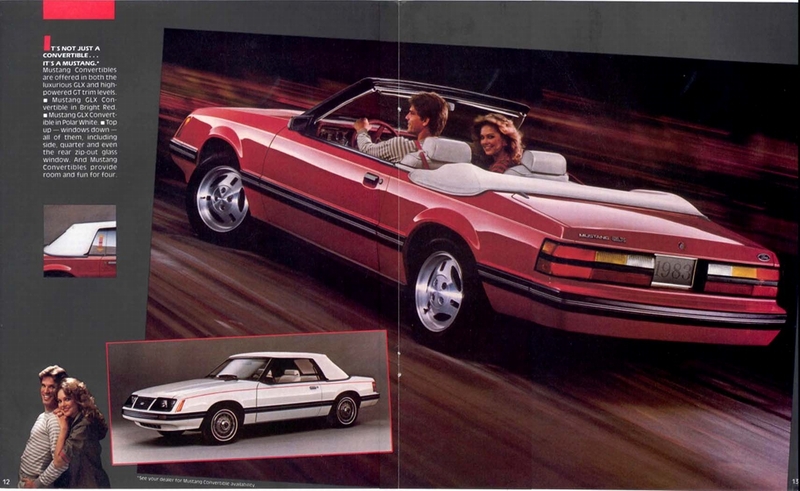 All 1983 Mustang convertibles came with a power top, and all windows rolled down—an emphasis Ford frequently made in reference to the Chrysler K car convertibles. Convertible pages from the 1983 Ford Mustang brochure, linked from the Old Car Manual Project’s amazing brochures section. The 1983 Ford Mustang convertible sold reasonably well considering its expense (the GT convertible stickered for 45% more than the GT hatchback). 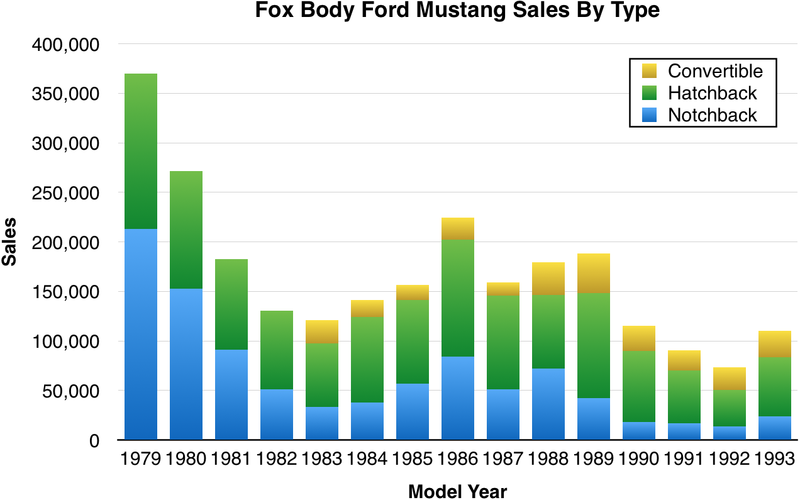 For that year, it probably saved total Mustang sales from dropping below 100,000—helping hold that off until 1991. Between 1983 and 1993, Ford would sell over a quarter of a million of the pony car convertibles. There is strong club support for the 1983 Mustang, as there is for all Mustangs except the mid-seventies Mustang IIs. According to Hagerty’s valuation tools, all the money for a 1983 Mustang GT convertible in #1/Concours condition is $21,000, with a more normal number #3/Good condition car going for $7,900. 1983 Mustangs often show up in the Hemming’s Motor News classifieds and on eBay Motors—as I update this in February 2019, there’s a 1983 Mustang GLX convertible with a white top, a white vinyl interior, a V8, and 25,000 miles available for $11,700. Make mine Medium Red, please.